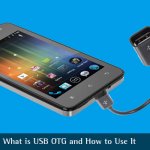 Do you Know What is OTG and How to Use OTG? When it comes to search on the World Wide Web, Google is the prime thought in every individual’s mind. Awarded for its innovation, Google Now is not simply called as the best companion; it has got several reasons! It has been brought into implementation from Android 4.1 Jelly Bean on Android Smartphones. Gradually, it proved to be a healthy competition to Siri (Apple iOS) and Cortana (Microsoft Windows). However, not every user is aware about all its striking and equally beneficial features. Image Credit: Phone with Music Cords via Shutterstock. Google Now is at service for the users based on their activities. 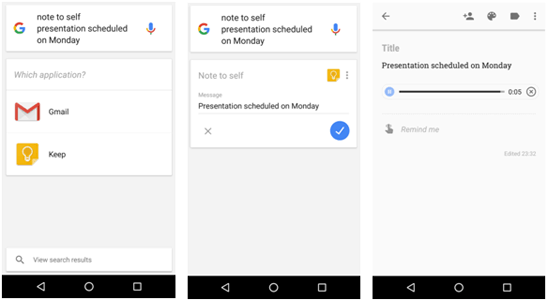 Its main functionality is to recognize and record repeated actions performed by the user on his phone, so that it can show up relevant suggestions, in the form of Google Now Cards, when needed or asked. Here’s a brief list of all the ways by which you can take advantage of Now in your daily life. So interesting it is to communicate with your phone; life’s made much easier! Yes, the Google Now responds to more than 50 awesome voice commands. The basic and common commands given by the users include search, call, send SMS/Email, date and time, navigations, Google+ post, set alarms, locations, browse WWW and what not! Consider you want to save some important note. Instead of crawling through app drawer, then Google Keep or your Email accounts and finally noting it down, you can use Now as shown below. Simply speak up “note to self Presentation scheduled on Monday“ and see the response you get. Weather is another simple command you can consider for gaining information about the current weather along with options of tomorrow and few days later for the same. 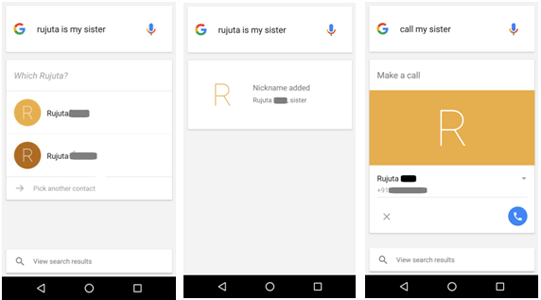 With Google Now, you can not only use contacts for calling by aforementioned basic commands, but you can also let your phone recognize your relationship with people in contact list. All you have to do is inform Now about any relation with a person, and the next time when you ask Now to call that person, you can simply command call my (specify relation). Suppose I want to tell Now that Rujuta is my sister. I will give the command as “Rujuta is my sister”. In response to this, Now will display all the contacts named ‘Rujuta’ in my list to confirm exactly about whom I am talking. On selecting the appropriate one, it will set up the relationship as sister. Then, when I wish to call my sister, I can command “call my sister” instead of call Rujuta. Setting up relationship with your contacts this way makes the communication with the device quick. Did you forget to carry dictionary while traveling to a new place? 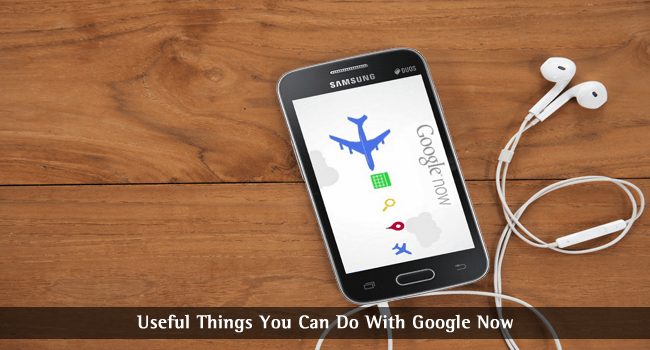 You need not worry when you have Google Now with you. 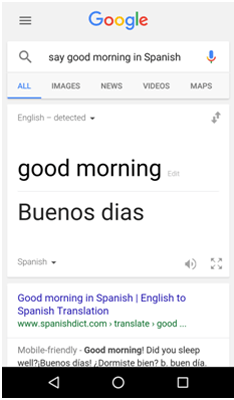 Translation has become easier with this innovation by Google and speaking to foreigners is no more a troublesome. 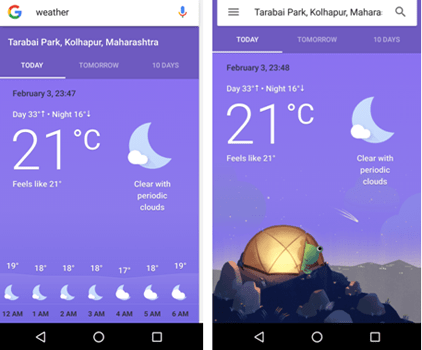 Google Now On Tap is introduced with the latest Android version of 6.0 Marshmallow. It came into limelight for its brilliant feature that searches within what is currently displayed when you tap and hold ‘Home’ at the bottom. The cards come up with suggestions and relevant information based on the content on the screen. Say, for instance, you received an Offer SMS from Domino’s Pizza. 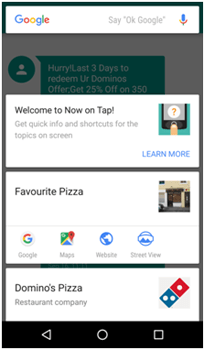 When you launch Now On Tap feature on the message screen, it will come up with cards suggesting Favourite Pizza (since the word ‘favourite’ was present in the SMS), Domino’s Pizza and so on. No doubt, for me Google is the best search engine and online services. It offers all the services you need in a single platform. Well, Thanks Aishwarya for this summarizing post of useful tips from google. Though I learnt many different tricks that I can apply now and make things easier. Android apps are perfect solution to bookmark your visitors. Wish there was some easy coding on iOS platform too.. Wonderful post! As I am on Marshmallow 6.0, I am enjoying Google Now on tap. It is very useful at sometimes. And in Google App, the Cards are making things easy for me. Like Tracking any E-commerce shipment or Checking the Stock price. Actually I didint know about “Shuffle it Well, Relationship Setup” features, Thank you. I Really wonder that Google Now can be this much useful. I once tried Google Now but I found it worthless but Reading your Post Inspire me to give it a try again.